This mosquito net bar is very useful for anyone who has to be out in the night, and has to sleep without adequate protection from insects and mosquitoes. It is large enough to fit over a camp cot or sleeping bag. The exact dimensions in inches are length 79, width 32, and height 59. The material used is high density polyethylene, to protect from very small insects. The edges have been reinforced to add extra strength, with corners which are double reinforced with ties. 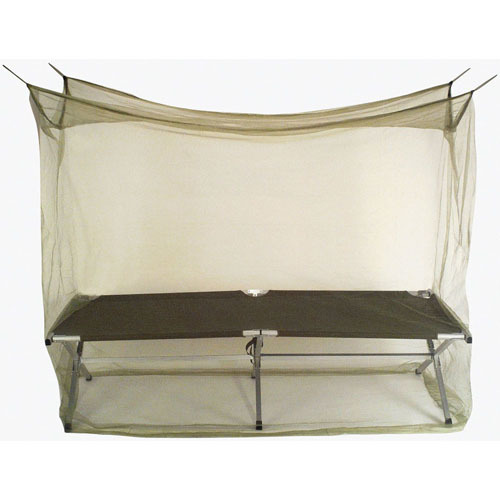 This net bar is easy to set up, fold, and carry. It comes in a pleasant olive drab color. Dimensions: 79" X 32" X 59"